What Will Happen To My Records? We all know that it is going to happen. At some point in time, we will exit mortality. We hope that our precious records, documents, photos and keepsakes will be passed on to someone who will treasure them like we do. If you are like me, you have invested a significant number of hours, cash and part of yourself collecting your family history. Was the effort all just a great hobby to be discarded when I die? I certainly hope not, but unfortunately, I've seen it happen repeatedly in my life experience. Someone will die and their children, extended family or friends have no interest in all that 'old' stuff and it goes into the trash, into a fire, to goodwill or is broken up an sold to antique stores for a little cash. Those who destroy these priceless collections have little knowledge of how dear and priceless the items are to other folks in their immediate family, to their descendants or to extended family members. How I wish I had my great grandfathers diary. I held it for a few minutes but was not allowed to make copies and was only allowed to take one photo. The owner died and the diary disappeared. I watched my uncles burn old photos of my ancestors when I was a youngster. 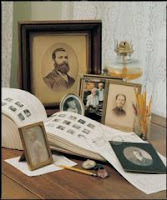 Fortunately for my family, my mother had interest in family history and when she found out what was happening, she sent me scurrying up into he attic of my grandparents home to retrieve many large old photos of my ancestors that had been stored there over the years. The photos now hang on the walls of the hall leading to my office. Every morning while walking to my office, I usually nod to a different grandparents photo and say hello. The photos help me keep my bearings when other demands threaten to entice my attention to activities that have no lasting value. The photos of my wife's ancestors reside on other walls in our home. As our children and grandchildren grow, I like to study these ancestral photos in an attempt to see whose genes are dominant in the current generations of the family. Some features are very prominently displayed while others are seen as an amalgam of angles, colors and bumps with less pronounced distinction. Have you made plans to protect your precious records after you pass away? We have added a codicil to our wills that specifically directs the way we want our records to be handled after our deaths. Some years ago, someone sent me a sample codicil that I found useful. I don't know who originally authored it, but doubt that they will care if it is shared with you. The wording is simple and straight forward. With a little thought on your part, you can create a similar codicil or feature in your own wills and trusts that will detail your long term wishes and planning concerning the survival of your family history records. Please remember that my genealogical endeavors consumed a great deal of time, travel, and money. Therefore it is my desire that the products of these endeavors be allowed to continue in a manner that will make them available to others in the future. You will be a lot more likely to get a library or archive to accept your genealogical records if you talk to the record custodians there ahead of time about your plans. Also, your will should direct your executor to agree to reimburse the accepting library or archive for their costs in accessioning the records, plus a few thousand extra dollars to go towards the library or archive's expenses for the records' long term preservation. Great post! This is something that I've thought about many times myself. I also came from Genea-Musings! Thanks for this post - Sounds like a good idea. Thank you for the reminder. I would suggest talking to the Family History Library in Salt Lake City, Utah about your records. The library would possibly be interested in having them after you passed away if your descendants did not want them and the research would be of benefit to the thousands of people that go to the library each day. Lovely!! In addition to finding some good, common-sense thoughts on preservation and keeping the work you did moving on where others who wish it will be able to find it, you have also included a sample address from a city and state that's near and dear to me, though I've never visited it myself. It's the city that my paternal grandfather was raised in. Are you from Jasper, AL? I have often thought of my untold number of hours of genealogical work ending up in the trash. It's funny how very few family members appreciate the importance of these records for future generations.Thanks for your excellent post, Lee!